Google is now pushing a new feature when you login to your Google AdSense console. The feature is named "Site Management" and it fundamentally allows you to categorize your ads by site. 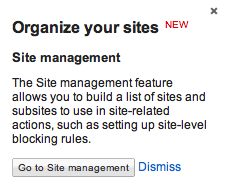 This allows you to create sites and then set specific actions by site in the list. So if you want to block specific ads from showing only on specific sites, you can easily do it this way. Here is the help page on this feature. I actually hinted to this feature on a post named Google AdSense Site Level Blocking.